Plantains are the banana’s favourite sibling. Actually, scrap that. They are the banana’s mother, and a mother that rocks!!!! Unlike the banana, plantains HAVE to be cooked before eaten (please don’t try to eat them raw) because of its high starch content but like a banana, you peel them before cooking them. You can get both green and yellow plantains. Green ones are usually finely sliced, or ‘chipped’ as we would say, to do as they say on ‘the packet’ to stay crisp and form crisps. Yellow plantains are the ones I favour and have grown up eating simply sliced and deep fried. As yellow plantains ripen the skin turns from yellow to black, (not to be mistaken for a bruised/rotten banana – a common and upsetting mistake made) making them so incredibly sweet and due to the starch turning to sugar as they ripen, they caramelise beautifully when you fry them. You can also lightly fry yellow plantains instead of deep frying them, as I tend to do, in a little vegetable oil and they still taste heavenly and caramelise cooking them this way! Or, as I recently discovered while cooking for my family and running out vegetable oil, they can be cooked on cast iron plate that has been lighted oiled/has the remains of oil on it, making the outside crisp up and slightly charred – perfect! Colour and touch wise while in the skin, you want plantains that are yellow, slightly soft/beginning to lose their firmness and with few black spots for this simple recipe. You don’t want them too soft as you need them to keep their shape and not mush and break up when you cut them into batons. These make the best salty and sweet snack or starter. 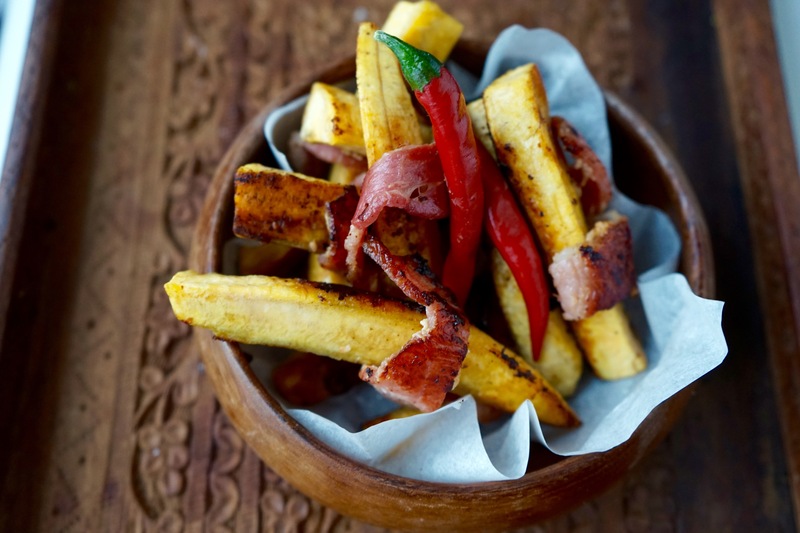 Plantains can be eaten cold once cooked but best to eat this recipe as soon as they are cooked. Oh, and serve CHAM CHAM Hot Pepper Sauce on the side – you won’t regret it! Put frying pan onto a low – medium heat and put a tablespoon of vegetable oil into the pan to heat up. When the oil is hot, but not smoking hot, place the plantains wrapped in bacon in the pan. Ensure there are gaps between each piece and the pan is not overcrowded. Turn after 3 – 4 minutes until side of each baton is cooked through and then repeat the steps above as you cook each batch. Serve up straightaway with CHAM CHAM Hot Pepper Sauce and enjoy!